Every year, the Yale Symphony Orchestra brings the Yale-New Haven community a musical experience of the highest quality while maintaining its mission to provide undergraduate musicians the opportunity to play in a professional environment, whether they are intent on a musical career, or they see it as a valuable extracurricular endeavor. Many of our alumni have gone on to successful musical careers, while others have continued to enrich their lives with music while pursuing other paths. The success of the YSO wouldn’t be possible without support from the generosity of independent donors. Thanks to donations from our patrons, local and University support, we are able to provide the Connecticut Shoreline communities with a series of professional-quality concerts at a cost less than that of a movie ticket. I encourage you to give to the Yale Symphony Orchestra so that we may continue providing undergraduates with a first-rate orchestra program, and allow the orchestra more opportunities to expand their exposure and experience through concert tours, recordings and special events. Please visit this link to connect to the Yale Development Office’s giving page. 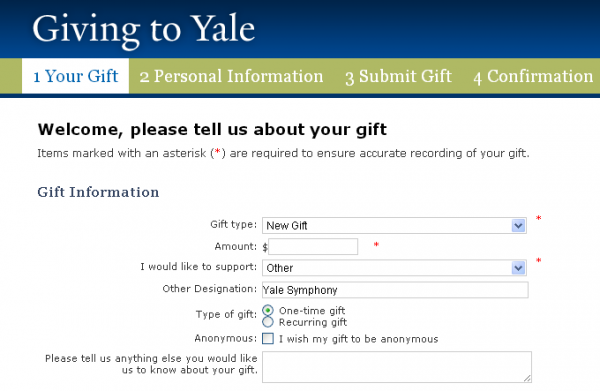 To make a donation by phone, you can call the Yale Development office directly at 800.395.7646 and indicate that your donation should be directed to the YSO.